Rhys Priestland will take an 18-month break from playing for Wales, according to his Bath coach Mike Ford. The fly-half, 28, has joined up with the English Premiership side following Wales' exit from the World Cup. 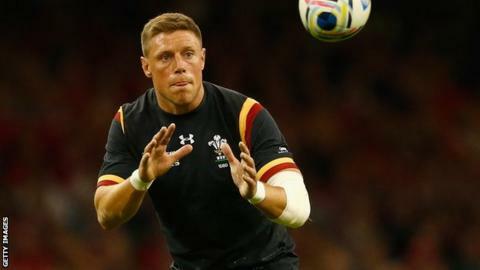 Priestland, who has won 40 caps for Wales, signed for Bath this year after 10 years playing for Scarlets and made his debut in Saturday's loss at Wasps. "We want Rhys with us and he's going to take a break from international rugby for the next 18 months," Ford said. "[It's] his choice and he wants to develop here, get settled at Bath and put a lot of effort and time into being the best player he can be at Bath. "When George [Ford, the England fly-half and son of Mike Ford] is away with the Six Nations, Rhys will be our 10. Priestland had been first choice for much of Warren Gatland's reign as Wales coach, and rose to prominence in the build-up to the 2011 World Cup. A late injury replacement for Stephen Jones in the first warm-up match against England, he went on to play a prominent role in Wales' journey to the semi-finals, and was an ever-present during the Grand Slam the following year. Like most who have worn the Wales number 10 shirt, Priestland was subjected to intense scrutiny during his Test career, and once admitted to seeking psychological help to cope with the rigours of international rugby. Dan Biggar was Wales' first-choice number 10 during the 2015 World Cup, with Priestland the reserve. On Saturday, he came on for Bath after Kyle Eastmond suffered an injury at Wasps, taking over at fly-half with Ford switching to scrum-half in the 16-9 defeat. "I thought he did very well, and he's been excellent in training for us," added Ford, speaking to BBC Radio Bristol. "It's a good acquisition for us to have George and Rhys fighting for that 10 position, because we relied too much on George last year."